The billboard is in Richland County on US 30, MLK Expressway. If Americans Knew erects billboards around the United States to tell Americans how much money goes to Israel, since U.S. media rarely report this. For example, legislation before Congress today will give Israel $38 billion over the next 10 years – the largest military aid package in U.S. history – yet no U.S. mainstream media have told Americans that this bill even exists. If Americans Knew is a nonpartisan, nonprofit American organization that provides information on Israel-Palestine to the American public, with particular emphasis on the U.S. connection. 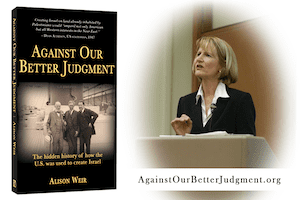 The founder and executive director, Alison Weir, is the author of the best-selling book, Against Our Better Judgment: The Hidden History of How the U.S. Was Used to Create Israel. Israel partisans often try to pressure billboard companies into taking such billboards down. Please stay tuned to see what happens in Ohio.